Taken 2002. Probably Charles Waterfield of Chequers (DE56 2DR), Shottle, about 1 mile away, with 3 children. A farm labourer, aged 27 in 1883, married to Sarah Hall in 1877. 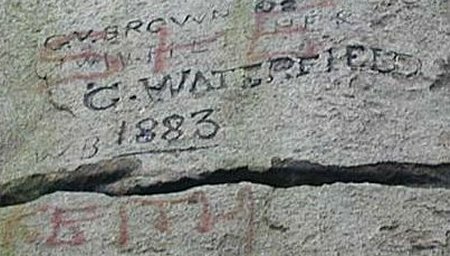 Signature well preserved because well carved into hard gritstone. Alport Height is a hill near Wirksworth in Derbyshire. 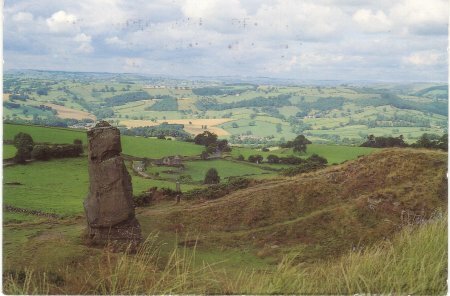 It is a popular picnic site, since it has quite good views to the South, and is the first hill over 1000 ft within easy reach of the Derby area. Like Shining Cliff Woods some 2km to the east, it is in the care of the National Trust. It is understood to have been their first acquisition in Derbyshire, acquired in 1930. The hilltop ambience is somewhat reduced by the large number of radio masts and buildings placed in a compound on the summit, (these are not on Trust land), but these do make the hill easy to identify for many miles around. 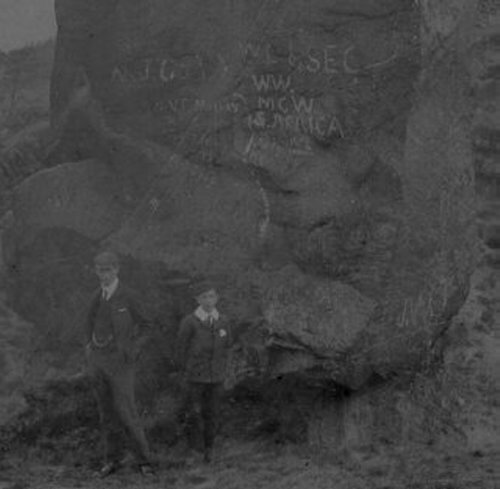 The hill is sometimes known as Alport Stone after the name of the conspicuous pillar of quarried gritstone, some 20 ft high, near its summit. 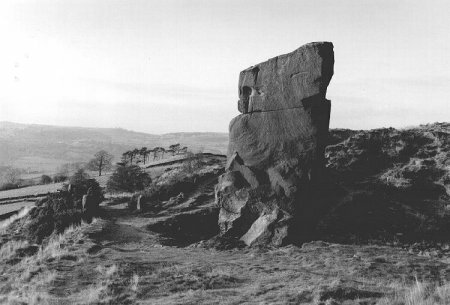 The boulder has 3 or 4 recognised routes up it, one being an 8m route of climbing-grade E5. 1906 RP card: Two boys and lots of grafitti. Addressed to "Miss C Ward, Beighton Hill, Ashleyhay, Wirksworth". (Google Earth: 53.060990, -1.566945). Could the two boys be Carrie's brothers, Edward and Clifford? They seem about the right age (21 and 13 in 1906).